Our popular seedling swap is a highlight of Brighton and Hove’s (suprisingly packed!) organic gardening calendar. 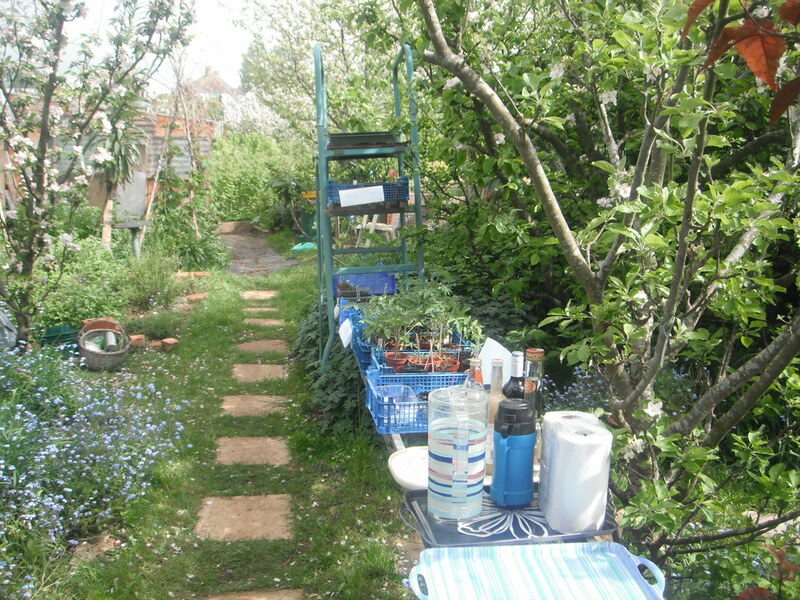 Almost 40 people came to enjoy the swap and the picnic, set in the apple blossom of Alan’s allotment last Sunday (10 May). There were a wide variety of hundreds of home grown organic seedlings to swap or make a donation with fellow green fingered enthusiasts. The organic seedlings – some were small plants – ranged from cucumber and courgettes to the beans and butternuts. There was a bounty of brassicas , hersb, saland and root veg… and rows of tomatoes of every kind – from small yellow currants to large red Italians! It was lovely to see old members and new members, ranging from past chairperson Jenni to Barbara, Debbie, Marina and Tom, who have starter beds on the BHOGG allotment nearby. An enjoyable morning ended with the added bonus of a number of good plants remaining that will boost our produce to sell at the Food Festival at the end of May on Hove Lawns.